VIP toilets for sale from the manufacture to South Africa, Africa and Rest of The World. Royal Tent is the leading manufacture of VIP toilets in the world. VIP toilets are great for giving any function professionalism thanks to its unique design and material quality. When making a VIP toilet we at Royal Tent spared no expense when it came to the buying of materials or getting only the most qualified people to do the job right the first time. VIP toilets are usually used for long periods and because of their high purchase prices, they are mostly bought. Royal Tent VIP toilets have become popular, affordable class products to serve the portable sanitation needs of party and wedding functions and production companies. 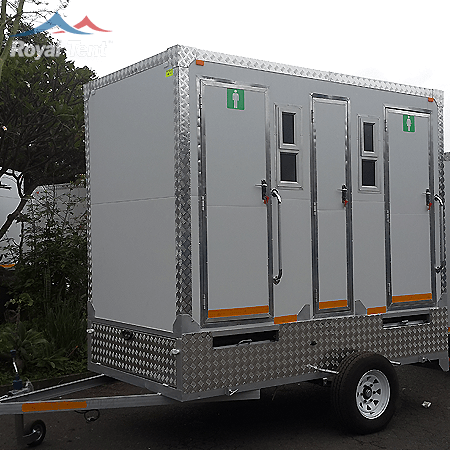 Royal Tent VIP toilets are manufactured at our factory and are for sale in South Africa, the VIP Mobile Toilet has become popular for any event or show as they boast great features, taking advantage of natural resources. The waste compartment is a solid unit but removable so disposal is easy and the taps are powered with pumps. Royal Tent VIP toilets have become popular class products to serve the portable sanitation needs of party and wedding functions and production companies. Royal Tent VIP toilets are engaged in offering a superior quality Mobile Toilet. This toilet is designed and manufactured by us using top quality raw materials inline with international standards. Royal Tent VIP toilets have become popular, affordable class products to serve the portable sanitation needs of party and wedding functions and production companies. The interiors lighting is powered by solar charged batteries. The male and female section is lockable and has a middle access hatch to easily get to the plumbing and batteries, at the same time providing a sound proof section between each toilet. VIP toilets are manufactured on order so place your order now and purchase them at the best possible price.